One of things I love about Krispy Kreme is that it's not just about buying donuts. Krispy Kreme is an experience. What kind of experience ? There's lots to tell. If you go to one of their donut factories, you get to watch an assembly line of donuts being dispatched at the "finish line" and ready to be served hot and fresh off the grill. When their krispy Kreme logo is lighted up, you get a free donut. Each time they open a new branch, they offer cool promos for the first few guests. They also introduce new and exciting themed donuts coupled with your favorite brands like the Chocolate Kreme Cakes made with Oreo, Hershey's Cookies and Kreme and Chocolate Karnival. They cater to the times like during the UAAP college basketball season where they introduced blue and green sprinkled donuts representing Ateneo and La Salle respectively. The list just goes on and on. Krispy Kreme just seems to come up with something new all the time. Their latest promo is the Krispy Kreme FaveFan Promo where everyone has a chance to win a year's supply of doughnuts including a trip to Krispy Kreme headquarters ! To celebrate 72 years of service (6 dozen in Krispy Kreme numerology), Krispy Kreme announces a worldwide search for its number one fan. The Krispy Kreme FaveFan Promo is open to 9 countries, Australia, Canada, Indonesia, Japan, Korea, Malaysia, Mexico, United Kingdom and the Philippines (aren't we lucky ?). To join, all you need to do is go to http://www.krispykremefavefan.com , click on the Submit Entry and complete the form. The form also requires you to answer the question "How has Krispy Kreme made your life special?" ( in a maximum of 1,000 characters). Include a photo with your entry and you automatically have a chance to be selected as the Krispy Kreme Fave Fan for the Philippines. Winners from all participating countries will win a year's supply of donuts plus a trip for two to the Home of Krispy Kreme. You'll also get the chance to design your ultimate donut ! Also join the Krispy Kreme FaveFan Promo Facebook page and be amongst the thousands of fans the ever-growing Krispy Kreme community has. Hurry and submit your entries now cause the deadline for joining ends September 15, 2009, 11:59:59 p.m. Philippine time. 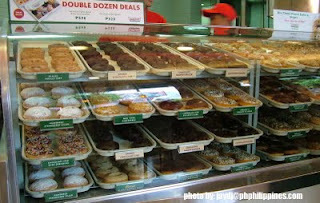 Log on now to http://www.krispykremefavefan.com and tell Krispy Kreme how they made your life special.